One couldn’t possibly ignore a signboard that promises you how to dive 20m with just one breath in 2 days and how to hold your breath for 3 minutes. As days went by, my curiosity grew exponentially especially given the fact that we are Advanced Open Water divers. In recreational diving, going down the depths of 20m is somewhat of a big deal for beginners. 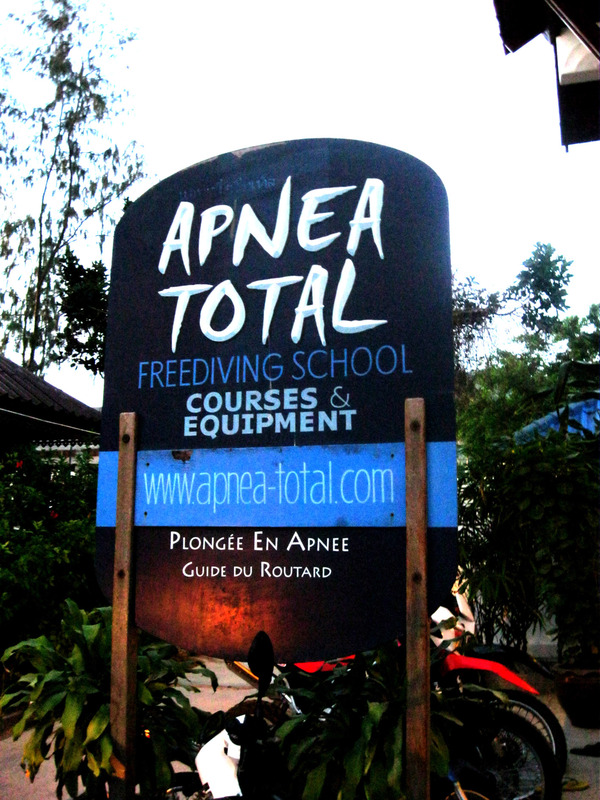 And when Apnea Total Freediving shop’s owner said it was easier to dive down 20m in one breath without a tank, every single logical neuron in my brain just went berserk. First day of Freediving class went underway and we began with a classroom session on how to hold your breath longer through relaxing and not thinking about time. I was the best in class as I had years of meditation experience prior to this. I was feeling somewhat complacent that this is going to be a breeze and began visualizing showing this off on my next dive trip. The boat took us out of the diving zones and into the deep blue. The atmosphere was different from what we were exposed to during our dive trips last week. Same sea, different world. When we went into the water to swim to the demarcation buoy they have set up for us to dive from, the clear blue water greeted me with an eerie aura. Though the water was significantly clearer than where we did our Advanced Open Water course, I could not see any underwater lifeforms and the seabed looks non-existent as if I’ll be diving down into a permanent abyss. They assigned one instructor to 4 students. I was lucky to get the head instructor. I went last and the first 3 did relatively well diving up to 10m of the required 20m on their first try. Being the best in class, everyone anticipated me to do better than 10m. I tapped out after 5m. I was so overwhelmed by everything I was doing. From inverting downwards, to pulling the rope to holding my breath and to how my other classmates are having a fun time doing it. I caught my breath and waited for the other 3 to do their 2nd rounds. They were at 15m on the 2nd round. This time round I was doing it for pride. I promised myself I would do at least 10m and would not tap out no matter what. Again I was panicking at 5m. The day drags on and my classmates eventually hit the 20m mark as indicated by a dumbbell anchored on the end of a 20m rope attached to the buoy we dove from. I was still struggling at 5m and I was extremely frustrated and the negative emotions are displaying themselves on the frowns on my face. The instructor pulled me aside and gave me a one-on-one motivational talk. With just one LONG advice, I managed to jump from 5m to 15m. But that took the whole of me and I could not do any better for the day. Still, I felt disappointed that the other 3 in my group were having a lot of fun while I am still struggling and frustrating myself out. Part 2 came the next day and I dragged myself to class. I was in a blur all the way until I was back at the diving buoy. This time round the instructor Pete, told me to go first. I did 10m on my first try with no enthusiasm and full effort. I was somewhat motivated but still disappointed from yesterday’s failure. The other 3 did the same but they were struggling at the 20m mark and could not improve further. The 2nd time I ignored everything including both my goals to dive 20m and my failures the day before. I just looked at Pete while I dove down. My body was gasping for air. I could sense death coming to claim my life. This was by far the most extreme thing I have ever done in my life to meet Death and seduced him to take my life. But I knew theoretically, this was just my subconscious defense mechanism operating in auto reflex mode and that I still had 1 min of air which is plenty. Through the pain I learnt how to overcome my very basic body operating systems of survival. And then my hand hit a hard steel object. IT WAS THE DUMBELL!! Though my body is vibrating in death mode as if I am being strangled, I was calm. I felt as if I never failed before in my life. I hurried to the top but even then, I still feel like I will never fail and in that frenzied hurry, I had absolute control over my body and mind. I was ECSTATIC!!! From that dive onwards, I became better and better and eventually claimed my title back as the best in class. Though I still could not gather enough courage to extend for the Advanced Freediving course to dive 40m with just one breath, I knew whatever I learnt in that 2 days just destroyed whatever I believed negatively about myself for the 28 years that I have lived thus far.